To launch its new line of Juke cars, Nissan is entrusting its brand to “two relatively unknown men with zero celebrity status.” Here’s why. The “virtual nobodies” are Jason Sadler and Evan White, the duo behind social media service I Wear Your Shirt, a marketing company that can be rented on a daily basis to promote brands on Facebook, Twitter, and YouTube. The pair will wear whatever apparel the sponsor chooses, acting as human billboards. As odd as that sounds, I Wear Your Shirt has attracted big names such as Doritos and Zappos, and the pair’s shirt availability is sold out through 2011. Nissan is the biggest brand yet to hire the pair, and they’re not only renting their chest space. 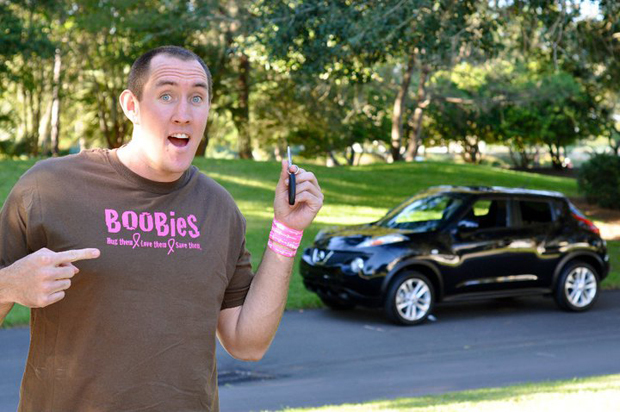 This week, Sadler and White are driving around the only two Nissan Jukes currently available in the U.S, and recording their experience through social media. Sadler and White will spend the week promoting the car with Facebook posts about the car, tweets about the experience, and funny antics in and around the car for YouTube videos. The idea is to create what Sadler calls “grassroots content,” which will resonate with the company’s strong social media following. And the cost for Nissan? Around $1,000. Technically, they’re just paying for shirt space. In other words, I Wear Your Shirt offers a counter balance to celebrities who want to charge a few thousand dollars for a handful of tweets — and to Twitter itself, which is charging $100,000 for promoted Tweets. While Ashton Kutcher and Kim Kardashian might have more followers than I Wear Your Shirt, the costs for purchasing sponsorship may outweigh the benefits of a Facebook post or Twitpic.